In the previous article (http://ponnadi.blogspot.in/2012/12/charamopaya-nirnayam-ramanujar-our-saviour-2.html) we have seen emperumAnAr's uththArakathvam revealed by many. Now, we will continue on with the next section where more such idhihyams revealing emperumAnAr's uththArakathvam are explained. Once when embAr was walking around meditating on emperumAn's divine qualities, bhattar sees him and offers him prostrations. bhattar enquires "there are two types of AchAryas (krupA mAthra prasannAchAryas and svAnuvruthti prasannAchAryas) and there are two ways of establishing the relationship with them (paragatha svIkAram and svagatha svIkAram); what is your opinion on this?". embAr replies "krupAmAthra prasannAchAryan is more important; paragatha svIkAram is the means for the ultimate goal. I have full confidence of these two in emperumAnAr. You also dont think with pride that 'periya perumAL adopted me as his son; I am AzwAn's son; I am master of all sAsthram; I have no worries'. Instead always think that emperumAnAr is your uththArakar just like I think about emperumAnAr". Once when bhattar completed explaining the meanings of thiruvAimozhi to nanjIyar, as per "prathyakshE gurava: sthuthyA:" (ப்ரத்யக்ஷே குரவ: ஸ்துத்யா:) meaning one should glorify his/her guru in the presence of the guru, nanjIyar requests bhattar to bless him by placing his lotus feet on his head. bhattar obliges and places his lotus feet on nanjIyar's head and tells him "these are not your refuge. I am doing this to fulfill your desire and attachment towards me. For you to accomplish the ultimate goal, you have to have firm faith and confidence on emperumAnAr's lotus feet which is the ultimate refuge for you, me and every one else. If you dont have that confidence, you will eternally suffer in this world". From this, it is established that, it is emperumAnAr's relationship towards us is the means for our upliftment and thinking that any other relationship will uplift us is ignorance. This principle is explained in amuthanAr in rAmAnusa nURRanthAdhi 79th pAsuram. When emperumAnAr who drove the bhAhyas (one who does not accept vEdham) and kudhrushtis (once who accepts vEdham and give wrong interpretation) is waiting to give the true knowledge and upflift every one, I am so worried for the people of this world who are ignorantly trying hard on their own to find a dheivam who will uplift them. According to this pAsuram, the only person who can uplift us other than emperumAnAr is emperumAn. But, when charama parvam (AchAryan) is present in front us, if we look for pratham parvam (emperumAn), that is the result of complete ignorance. This principle of going to prathama parvam (which is difficult to reach out) instead of charama parvam (which is readily available) in front of every one, is nicely explained by aruLALa perumAL emperumAnAr using an example in jnAna sAram 33rd pAsuram. Ignoring the AchAryan who is visible right in front of us (due to thinking that he is also a human being like us) and reaching out to emperumAn who can only be known by studying sAsthram and who is far away in paramapadham is like an ignorant person who is very thirsty and who has water in a container right in his hands drops the container and looks up to the sky for clouds to bring rain. 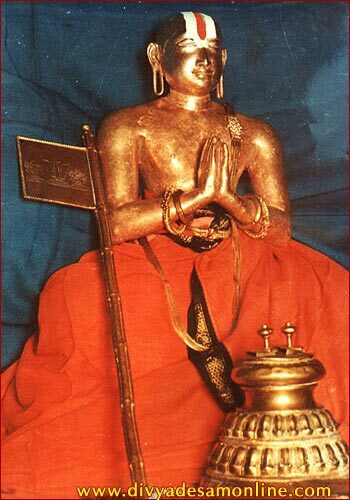 vangi purathu nambi says "One who does not have charama parva (AchArya) nishtai will not have prathama parva (emperumAn) nishtai, but one who does not have prathama parva nishtai can have charama parva nishtai". This means "One who does not understand and practise subservience to an AchArya will lose his subservience to bhagavAn. One who does not have knowledge about emperumAn will serve an AchAryan to acquire the same. But one who is fully situated in AchArya nishtai will not go to emperumAn". It can also be explained as "One who does not have a relationship with an AchAryan has lost his svarUpam of being subservient to emperumAn. Since he has lost the abhimAnam (attachment) of emperumAn, he has to surrender to an AchAryan to earn that abhimAnam. But one who is fully situated in AchArya nishtai, need not even have the abhimAnam of emperumAn (since it will automatically be present in emperumAn when he sees the sishyan's total dependence on AchAryan)". From this we can understand that "emperumAn will give up the ones who does not have the relationship with emperumAnAr. emperumAn will give up the jIvAthmA due to him looking at the endless defects in jIvAthmA. On the other hand, emperumAnAr does not give up on such jIvAthmAs. For the ones who are related to emperumAnAr, they need not separately look out to emperumAn for the accomplishment of the ultimate goal. When one is situated in "dhEvu maRRaRiyen - mEvinEn avan ponnadi meymmaiyE" (தேவு மற்றறியென் - மேவினேன் அவன் பொன்னடி மெய்ம்மையே) meaning I know none other than emperumAnAr and I have surrendered to his lotus feet, we will certainly accomplish the goal. That is why madhurakavi AzhwAr mentioned "ponnadi" - meaning it will fulfill our desires just like (materialistically speaking) gold can get whatever we want. So, in all different ways, emperumAnAr is the saviour for everyone. The ones who does not take shelter of such emperumAnAr will suffer in this samsAram forever. When being situated at the lotus feet of emperumAnAr, we should constantly meditate on his divine names. amudanAr compiled and blessed us with rAmAnusa nURRanthAdhi which brings out the many names and glories of emperumAnAr - meditating on which we will develop attachment towards emperumAnAr's lotus feet. This is what is explained in the first pAsuram itself - "irAmANuchan charanNAraviNtham NAm manni vAzha NenYchE cholluvOm avan NAmanGgaLE" (இராமாநுசன் சரணாரவிந்தம் நாம் மன்னி வாழ நெஞ்சே சொல்லுவோம் அவன் நாமங்களே) meaning to live happily at the lotus feet of rAmAnujar let us constantly recite his divine names. To show that when one is not reciting/meditating on his names, it is not possible to be situated at his lotus feet, amudhanAr says that one should meditate on his names to be situated at his lotus feet. For such persons who constantly mediate on emperumAnAr's divine names and be situated at his lotus feet - both the path and the goal are the same - i.e., emperumAnAr's lotus feet only. This principle is explained and ascertained by amudhanAr in pAsuram 45 as "pERonRu maRRillai Nin charanNanRi, appERaLiththaRku ARonRumillai maRRach charanNanRi" (பேறொன்று மற்றில்லை நின் சரணன்றி, அப்பேறளித்தற்கு ஆறொன்றுமில்லை மற்றச் சரணன்றி) meaning your lotus feet are the ultimate goal and to accomplish that your lotus feet are the path as well. Since it is clearly said in this pAsuram that there is no other goal, once we are situated in the charama parva (AchArya) nishtai, we should not have any direct attachment to pratham parva (emperumAn) nishtai. Thus such AchArya nishtai should not be mixed with bhagavath nishtai, otherwise, such persons who have both nishtai will be called "irukaraiyar" (இருகரையர்) - one who is holding on to both AchAryan and emperumAn. vaduka nambi, when he goes to the assembly headed of emperumAnAr, he offers his praNAmams to emperumAnAr and goes to his side and stands there. emperumAnAr said "vaduka nambi is my madhurakavigaL" just like AzhwAr had his madhurakavigaL. It is because of his nishtai, vaduga nambi said kUrathAzhwAn and mudhaliyANdAn are "irukaraiyar" (one who holds on to both emperumAnAr and emperumAn). Once emperumAnAr asked vaduga nambi "vadugA! How will an AchArya abhimAna nishtan be?" and he replies that He will be like "vEmbin puzhu" (வேம்பின் புழு) meaning a worm which lives depending on neem tree which is very bitter. Such sishyas will always depend on their AchAryan's attachment towards them just like these worms that always depend on the neem tree. He said worm on neem tree instead of sugarcane tree to show that, even when the AchAryan is unhappy with the sishyan and punishes him, the sishyan should still depend on him only just like the worm does not leave the neem tree even though it is bitter. This similar to thirumazhisai AzhwAr's words in nAnmugan thiruvanthAdhi "NAnunnai anRiyilEn" (நானுன்னை அன்றியிலேன்) meaning I have not existence without you and nammAzhwAr's words "kaLaikanN maRRilEn" (களைகண் மற்றிலேன்) meaning I depend on no one else even when you dont remove my obstacles in reaching you. From these we can understand that, one who is situated in emperumAnAr's abhimAnam and constantly serving him by his body, words and mind will never assume anyone else other than emperumAnAr as his saviour - when surrendered to the one who can uplift every one why should we look out for any one else. This is explained by amudhanAr who is an expert in all vEdha sAsthrams in pAsuram 95 "palluyirkkum vinNnNin thalai NinRu vIdaLippAn emmirAmAnuchan" (பல்லுயிர்க்கும் விண்ணின் தலை நின்று வீடளிப்பான் எம்மிராமானுசன்) meaning emperumAnAr who descended down to this samsAram from paramapadham just to uplift everyone who has the desire to be saved. Once nampiLLai visits emperumAnAr sannidhi, recites rAmAnusa nURRanthAdhi in front of him and performs sARRumuRai. He looks at the divine face of emperumAnAr and requests him to give him a good instruction and returns to his thirumALigai. That night, emperumAnAr appears in nampiLLai's dream, places his divine lotus feet on the divine head of nampiLLai and tells him "if you want a good instruction, always think that these are your refuge and instruct the same (that my divine lotus feet are the refuge) to your sishyas also. There is no better instruction than this". nampiLLai then shares this incident with periyavAchAn piLLai and periyavAchAn piLLai very carefully and affectionately listens to those valuable instructions. During nampiLLai's final days, periyavAchAn piLLai requests him to give a final instruction and nampiLLai says "when we have emperumAnAr's lotus feet as our refuge what more do we want. We dont have to worry for the ultimate goal since we are already protected by emperumAnAr's abhimAnam towards us. By accepting that emperumAnAr's lotus feet are our refuge and by constantly meditating on that, you will get the same result as I have got now". In the next article, we will see the concluding section of this divine grantham.